Saturn rings on Earth? 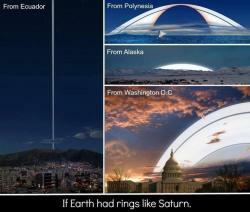 : What would the sky look like if Earth had rings like Saturn? This shows the scale of those rings in Washington, D.C. and other points across the globe.Courtesy Ron Miller Just from watching the opening of Star Trek episodes, we've heard that space is vast. But to we really understand the scale of things comparing our little planet with other planets, stars and galaxies? This collection of illustrations helps grasp those concepts better. Hang on tight!